Creating reports with customised layouts is one of the best functionalities in the Traffic Control System (TCS). It allows you to filter information and organise it to your own insight, requirements and use. This can be achieved in only a few clicks and can be edited just as fast. You’ll master it in no time with our handy manual. Almost every screen in TCS has an action menu within the screen. These menus contain option for data filtering and/or visualisation. Subsequently, the created layout can be saved. You can save an unlimited number of layouts, which is useful if you are required to provide information to departments or colleagues in different ways. The action menu is a friend to all “data junkies”. The option to add unused columns to a layout, or even remove columns. Manual addition of a data filter. This can also be done with the use of a search term or a column search term. 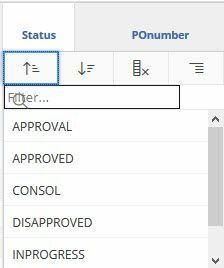 See “column properties”, available by right-clicking “column title”. Increase or decrease number of rows. Choose from a range of data filters, format options (highlights) and sorting across several columns. Pro Tip: the ‘Group By’ functionality helps to group similarities and differences. This gives a whole new dimension to a report. You can set the grouping to a chosen column. 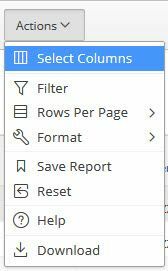 Did you add or delete a column, with or without extra filters? Then don’t forget to save the new layout. Refreshes the page and resets to “Primary Report”. This turns off any filters you had added to your layout. Information sheet with standard Oracle Apex explanations on the functionalities of the action menu (only available in English). The displayed data can be exported in 3 formats: CSV, HTML and e-mail weblink. If you have many open filters and highlights, this could result in a very full screen. This is because all filters are stacked. The “>” icon can be used to collapse the filters into 1 line. This will give you more screen space to display data. Have you completed your own layout? Then save it as “private report”. Download the print version of this manual.